Screen 1: A Track Stack can be used to create a complex layered instrument including multiple instrument plug-ins and effects busses. You can assign controls from the elements of the Track Stack to Smart Controls to create your own editing interface. In this month’s Logic workshop we’ll look at the Track Stacks feature, which allows you to parcel up different combinations of instruments and effects to create unique and easy-to-use patches. When creating a Track Stack you are essentially defining the architecture of a custom synth, where you can choose how many instrument layers the sound will be constructed from and what effects it will have. Logic then takes the customisation a level further by allowing you to map any parameter from your Track Stack to a series of Smart Controls. Smart Controls when paired with a Track Stack are hugely powerful and can be used to define new control relationships between the effect and synthesizer parameters by assigning multiple parameters to a single knob and altering their value ranges, or the ways in which they respond. By choosing only the key elements, you can streamline your control layout making you more productive. Many classic presets from digital synthesizers relied on layering two or more sounds together with a series of effects in order to create a more interesting patch. We’ll achieve this using Logic’s Track Stacks feature to create a simple piano and pad patch with effects (see Screen 1, above). In a new project, add a single Software Instrument track with an instance of EXS24 on it. Load the Steinway Piano 2 preset. To create the effects architecture for our patch, we will add busses for delay, reverb, chorus and distortion. On the channel strip create four effects sends using buses 1-4, and assign your favourite delay, reverb, chorus and distortion plug-in to each bus. To create the second instrument part, make sure the Steinway Piano 2 track is highlighted, then use the Duplicate Track button. On the newly created track load the EXS24 / Mellotron / Mellotron preset. Now let’s create tracks on the Arrange page for our effects returns so that we can later combine them into our Track Stack. Open up the mixer and select the aux strips 1-4, then Ctrl-Click on one of them and, from the drop-down menu, choose the Create Track option to add them to the Arrange page. To group these building blocks into a single container we need to create a Track Stack. Highlight all six tracks on the Arrange page and then Ctrl-Click one of the track headers. From the menu choose Create Track Stack, then from the pop-up dialogue choose the Summing Stack option. Let’s now turn our focus to how we will interact with our patch using Smart Controls. One of the great features about Track Stacks is that you can configure the Smart Controls to control any automation parameter from any track within the Stack. Click the Smart Controls button to open the Smart Controls area — this is in the top-left corner of Logic’s interface with a dial icon on it. Before you can assign parameters to Smart Controls, your current Track Stack’s channel strip must have at least one plug-in loaded that is not a Channel EQ. Add an instance of Logic’s Compressor and load the Keyboards / Piano preset. The Smart Controls will be automatically populated by the parameters from Logic’s Compressor. Also add an instance of the Channel EQ plug-in so that we can filter the entire patch. Now that we can access the Smart Controls, let’s customise their assignments as well as the look and feel. When working with Smart Controls the first thing to do is to choose a Smart Control layout. From the Smart Control toolbar open the Inspector by clicking on the (i) icon. In the Inspector, click the Automatic Smart Controls button and from the menu choose the Modern Synth 2 Tab layout. This layout has two tabs but for the purpose of this article we will focus on laying out just the Controls tab. Let’s assign the parameters shown in Screen 1 to the different Smart Controls. Begin by assigning the Channel EQ’s High Cut Filter Frequency and Q parameters to the top-left two knobs. First, open the Channel EQ and turn on the High Cut Filter band. Next, click on the knob in the top left of the Smart Controls interface. The Smart Controls Inspector will now display the assignments for the selected control. To assign the Frequency parameter to the knob, click the Learn button in the Parameter Mapping area, then go to the Channel EQ plug-in and move the Frequency parameter of the High Cut Filter. Logic assigns this parameter to the knob and the knob takes on the parameter name. To assign the Q of the High Cut Filter, click on the next knob and this time move the Q parameter in the channel EQ plug-in. You have now assigned the cutoff and resonance of the filter and can control it using the Smart Control knobs. Try the Smart Controls you have just assigned to see how they feel: the upper range of the Q parameter can produce quite piercing results, so let’s reduce the parameter’s range. Go to the Inspector and from the Parameter Mapping area set the Max value box to 49; this will halve the amount of boost. Lastly, rename the controls Cutoff and Resonance by double clicking in the label field above the Parameter Mapping section. Screen 2: Smart Control knobs can have multiple parameters assigned to them; here a single control is adjusting the Attack and Attack via Velocity parameters of the piano and Mellotron parts. Smart Controls also allow you to assign multiple parameters to the same knob. Let’s use this functionality to control the attack and release settings of the amplifier envelope for both synthesizer parts at the same time. Click on the knob in the bottom left so it is highlighted, then from the Inspector let’s manually assign the attack parameter from the piano part. In the Parameter Mapping section click on the up/down arrow icon beneath the Learn button to bring up the assignment fold-out menu (see Screen 2). Navigate to the Steinway Piano 2 / 1EXS24 / Envelopes / Env2 (Amp) Attack parameter. Now let’s add another parameter to the control by clicking the cog icon next to the Learn button and from the drop down menu choosing Add Mapping. Now assign the Mellotron’s attack, by navigating to Mellotron / 1EXS24 / Envelopes / Env2 (Amp) Attack. Because of the way the EXS24 envelopes work you will also need to assign the Env2 Att via Vel parameter for each part to the same control, in order to avoid the Attack parameter moving the Attack Vel parameter and leaving it stuck at its maximum value. Now assign the Env2 (Amp) Release parameter for the piano and Mellotron parts to the knob next to the Attack knob, and the remaining six knobs to the level of the two instrument parts and the four effects busses. To finish off our Controls page, let’s assign parameters to the two X/Y pads. When the Inspector is visible, clicking on an X/Y pad will display a line for each axis; these lines are selection targets to enable the Inspector to display the assignments for each one. 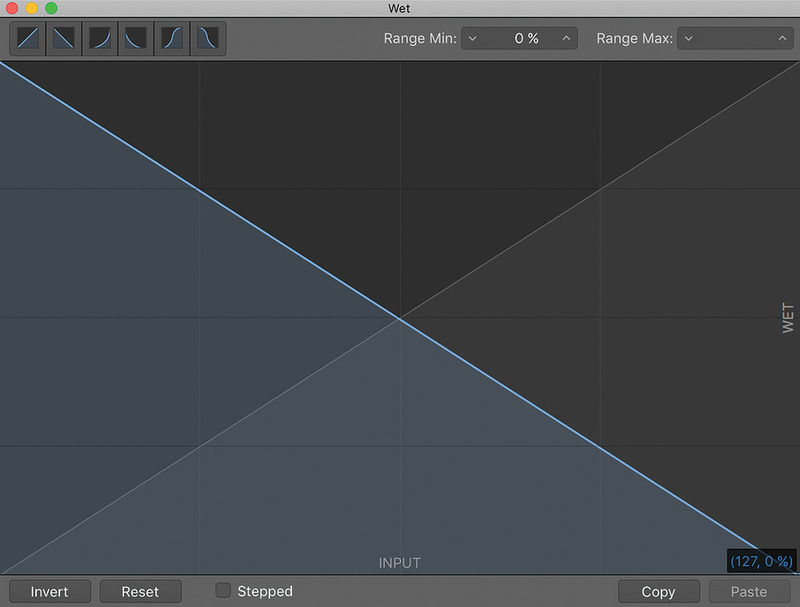 Click on each axis and use the Parameter Mapping area to assign the cutoff and resonance of the Channel EQ to the X and Y axes of the first X/Y pad. 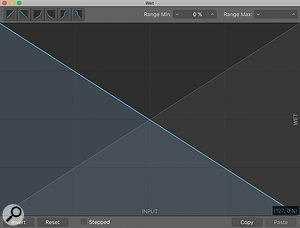 Screen 3: The Parameter Graph pop-up window allows you to remap or scale the output sent by a control. Here I have inverted the output of the Echo Wet parameter.Move across to the second X/Y pad. This time we’ll use the flexibility of Smart Controls to define a new control relationship with an insert effect. 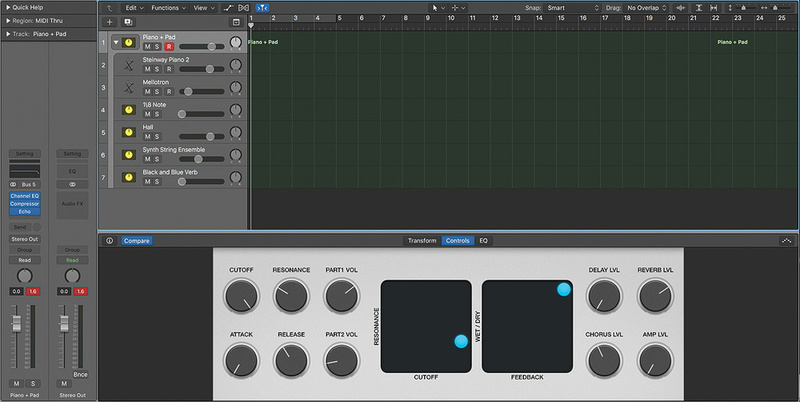 Add an instance of Logic’s Echo plug-in to the Track Stack channel strip. Now let’s assign the second X/Y pad to do some interesting things with the Echo effect. Assign the vertical axis of the second X/Y pad to the Echo plug-in’s Dry and the Wet level controls. Let’s customise the interaction with the Wet parameter so it works in the opposite direction to the Dry parameter, effectively creating a mix control. From the Inspector’s Parameter Mapping section select the Echo / Wet parameter and then click the Open button in the bottom right-hand corner of that section to bring up the Parameter Graph window (see Screen 3). The Parameter Graph window allows you to change, remap or scale the output sent by a control. Click on the Invert button and close the window. Now as you move up and down in the Y axis of the X/Y pad, you will hear no echo effect at the top and a fully wet echo sound at the bottom. To finish off, assign the X axis to the Echo / Feedback parameter. Now if you drag from the top-right corner to the bottom-left corner, you should hear a pronounced delay effect. Last of all, click the (i) icon to hide the Inspector. The Smart Controls are now in performance mode and will be more responsive.